Pirate fever sweeps through the town after an opportunistic treasure hunter shows up looking to lay claim to Blackbeard's lost gold buried somewhere in Tupelo Landing. 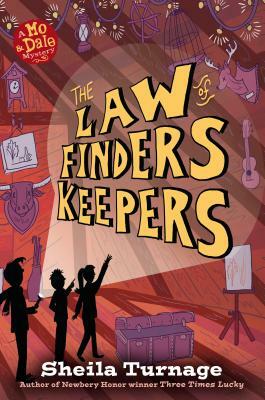 When the (probably) world-famous Desperado Detectives--Mo and Dale and Harm--are hired by Mayor Little's mother to find the pirate loot for her, and the high-stakes race for riches is on! But that's not the only treasure hunt in town. Mo LoBeau unearths shocking new clues that may lead to her long-lost Upstream Mother--in the riskiest, scariest, and possibly richest case of her life. Will Mo find her Upstream Mother? Can the Desperados sidestep Blackbeard's curse and outsmart a professional treasure hunter? Will Dale faint under the pressure of Valentine's Day? Could the stakes be any higher? Yes. With twin treasures hanging in the balance, Mo, Dale, and Harm realize one of them may have to leave Tupelo Landing. For good. Readers can come to this new Mo & Dale Mystery right after Three Times Lucky if they like. And don't miss the rest of the Mo & Dale Mysteries! Sheila Turnage is from eastern North Carolina, just like Miss Moses LoBeau, the protagonist from the Mo & Dale mystery series that began with Three Times Lucky. Three Times Lucky is a Newbery Honor Book, a New York Times bestseller, an E. B. White Read-Aloud Honor Book, and an Edgar Award finalist. It has been nominated for nineteen state awards, including the Texas Bluebonnet Master List, and has been licensed in five countries. Her follow-up book, The Ghosts of Tupelo Landing, also a New York Times bestseller, received five starred reviews and was a SIBA Winter 2014 Okra Pick and a Junior Library Guild selection. Sheila is also the author of two more books in the Mo & Dale Mystery series, The Odds of Getting Even and The Law of Finders Keepers, and the nonfiction adult books Haunted Inns of the Southeast and Compass American Guides: North Carolina, as well as one picture book, Trout the Magnificent, illustrated by Janet Stevens.